I'm with you on the Heart Attack Grill I would be there in a blink of an eye. Topaz advertising is bogus. Shame on anyone gullible enough to believe it, but... Any good hamburger is fattenning. My favorite burgers are from Cheesecake Factory, the Classic 12 oz. grade A beef. eh, if I'm in for eating a hamburger, I am certainly not counting calories. To answer your question: Potatoes fried in pure lard are delicious. I'll be posting on them in greater detail soon, so keep your eyes peeled. Thanks elmo for an awesome post, it was most enjoyable. Gotta say that lard fries sounds delicious but I wonder how it stands up to the taste of Crow Bar's duck fat fries. Also, is it wrong that I enjoy a Big Mac or a double cheeseburger from McDonald's ever so often? I find their processed, bastardized ingredients to be irresistibly delicious sometimes, perhaps it's those tiny chopped onions or Mac Sauce. The first time I ate at Topz in Orange, it had just opened. I pretty much was given a hockey puck on a bun (that hard and small) and swore I wouldn't go back. But, I kept seeing that it was getting busier and busier. So last week I took my mom there. You think I don't like her, huh? It was lunch time and after what seemed like 1/2 hour we were served. The angus burger looked like yours in the picture and was decent in taste. The thing I liked the most from the whole thing was the garlic ketsup. But I won't go back. My review was the same as yours. Heart Attack Grill would do killer business here! Pun intended. So right. 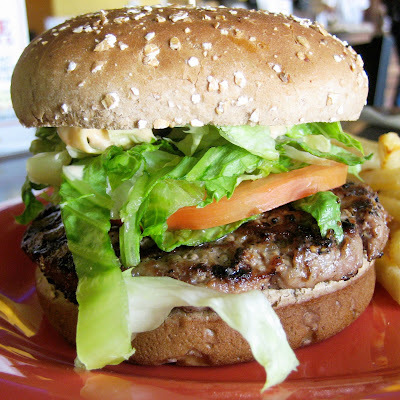 When you have a burger, you have to concede heart-healthiness. This Topz, in Santa Ana, seems to be doing pretty well too. Though if it's any indication of what people really want for lunch, most order the regular burgers...and sometimes they add cheese and bacon! I guess "healthier" is a relative term. Fries in duck fat vs. fries in pork fat...hmm that's a taste test I'd love to judge. But, I'm as guilty as anyone when in comes to McDonald's. My vice is their soft serve cones. And their Egg McMuffins. And their fries. And if I'm in Hawaii, their Haupia Pie and Local Breakfasts! And I do love those little bits of onion on their burgers. To quote Harold and Kumar, "they're like little flavor crystals". I think it would be a better burger if it cost a buck. Then all of its claims to be healthy is moot, and it just becomes a cheap/honest lunch. I think Kat from Gluttonista said it best when she mentioned that she ended up eating less because she didn't like the food...so in a sense she *WAS* eating "healthier". I heard grill and raw onions in an In n Out burger is really good. I haven't tried it. And more importantly, how great would it taste? Exactly. 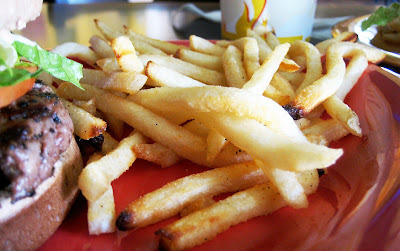 ;) I eat fries very rarely because, like you, I enjoy them well done. Crispy. And too few people really make them how I like them, so I refrain rather than have mediocre ones. I'm sure I would hate the ones at Topz. As for the burger... well, it's basically no better nutritionally than the Big Mac so what's the point? Good on you for trying it out, but I think I'll stay away. And I have no favorite burgers except for my own. ;) Really, I never used to like burgers because I could never find them juuuust to my liking (meat flavor or toppings). So now I make killer ones (beef or bison) at home. It IS! Animal Style gives you grilled onions and pickles. But then when you add fresh onion on top of that: Shazam! Yeah! Exactly. The numbers just don't justify it as really all that different from other burgers nutritionally...and what's more, the other number (the price) just adds to the problem. And I'm so with you on the fries. Also if it's not fried, it can't be called that. Who cares about all the health aspects of this burger? Or any burger for that matter?! It would be like writing about driving a Ferrari and having most of your write up about all the dangers of driving fast, comparing the various speed limits of various cities, and the dangers of going above the speed limit. I am glad you did write a few sentences about the taste of the burger and such. Because of you, iI will avoid this place. Thanks for the description of the food. What if the makers of the Ferrari started marketing their cars as the safest cars. That they're safer than Volvos, but they still go really, really fast like Lamborghinis. It's like they're saying: "Ferraris: You can go as fast as you want, and if you just happen to crash, you will never die!" Shouldn't the reviewers at Car and Driver, or perhaps Consumer Reports, try to refute or verify those claims? That's what I am: The Car and Driver Consumer Report. My verdict: This Ferrari is just as expensive as a Lamborghini. It's just as safe as a Lotus. It drives like a Ford. Hey Ferraris don't drive like Fords, let's not get crazy here! I wouldn't know: I own a Honda! HAHA! Okay. Somewhere in here, I lost the analogy. I would eat a Ferrari personally. I would make out with a Ferrari. I dont care how dangerous it is. I would have babies with a Ferrari. I think we all digressed a bit. But hey, it's all in the name of fun! Wow, you're the "Man", Elmo. I was just thinking about Topz and hoped you wrote about it...yup! You sure did! Thanks for the worthy, entertaining and nutritionally informative read. But maybe I'll stick to my 4x4 burger at In N Out and their lovely, artery clogging "animal style" fries. I can't go healthy when it comes to a burger, just cant! Besides, I CAN'T STAND burgers on whole wheat buns...yuck! What a waste of good, fatty meat! Yes. If there's anything that wheat bun shouldn't be used for, it's a hamburger. In fact, I think wheat buns ate good for nothing. Wheat bread is one thing, wheat bun is something else. you should try the counter in irvine.. there burgers are sooo darn juicy! They may look fine, but they're just okay. Check out The Counter as Pauline suggests. Here's a review of mine for The Counter.